Now in its fourth year of operation, Diamond Light Source continues to deliver fresh insight to all those who use it, from physicists and chemists to archaeological investigators, conservationists, materials engineers and bio-medical researchers. Diamond is a synchrotron, a machine designed to produce focussed, very high intensity light that can be used to help us study the world around us on the atomic and molecular scale. ‘It’s a particle accelerator that sends electrons round and round in a continuous motion, to ultimately create extremely intense beams of light’ explains Dr Stephen Thompson, senior beamline scientist at the Oxfordshire-based facility. 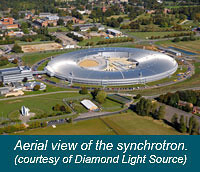 The synchrotron accelerates electrons close to the speed of light, using powerful magnets to keep them on course as they whizz round its 562m circumference ring. When a charged particle passes through a magnetic field, it loses some of its energy in the form of light. This light is concentrated into a narrow but extremely intense beam no wider than a human hair. ‘The light is then funnelled off in to experimental stations, which we call beamlines, that have various conditioning optics to select the segment of light that we want, for example infrared, ultraviolet or X-rays. It is then channelled on down into an experimental hutch where a sample has been placed,’ continues Thompson. At the point where the beam is focussed onto the sample, the X-ray light is several billion times more intense than the light produced by a hospital X-ray machine, which radiates light over a wide angle. 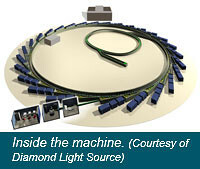 The dazzling brightness of Diamond's synchrotron light gives researchers the opportunity to scrutinise their samples, whether liquid, solid or gas, right down to the atomic scale, using a variety of techniques to give them the best possible view. One such technique is diffraction. Materials deflect light in different ways depending on what they are made of, so by studying the pattern projected when light is shone through a sample, scientists can determine its atomic structure. Light has been used by scientists in this way for years, with X-ray diffraction for example allowing Watson and Crick to uncover the structure of DNA in 1962. But the dazzling brightness of Diamond gives scientists access to much higher resolutions and hence better detail than could ever be achieved using traditional X-ray generators, or indeed even with earlier generations of synchrotrons. One current project aims to unlock nature’s secret recipe for making large structures using calcium carbonate. ‘Shellfish evolved the ability to make protective structures from rare forms of calcium carbonate millions of years ago - we’re trying to work out how they do it‘, explains Thompson. Understanding this process could lead to the development of bone replacement materials for medical use or lightweight fracture resistant materials for engineering applications. Diamond could also help shape the cars of the future by developing new materials for hydrogen storage. ‘As petrochemicals run out, people are looking at hydrogen as a possible fuel source particularly regarding transportation, but it’s difficult to store because the gas is very low density,’ says Thompson. Recent success stories and ongoing projects at Diamond include helping to elucidate the longstanding mystery of how HIV establishes itself in the human body; enabling steps towards earlier cancer diagnosis; studying the microscopic stresses and strains on aerospace components; furthering our understanding of Alzheimer’s disease; and looking at how earthquake waves spread, to name just a few. With 18 beamlines currently in operation, and four more scheduled to be online by 2012, the facility can potentially support up to 40 beamlines in total - so it looks like these successes will not be the last.